With Halloween around the corner I thought it would be fun to investigate the spiritual history of knitting, crochet, and related arts. During the nineteenth century works of oneirocriticism (dream interpretation guides) were a popular facet of Victorian spiritualism. The collections of the Library Company of Philadelphia include a wonderful assortment of books drawn from this movement. A favorite among them is Strong’s Cabinet of Conjurations! 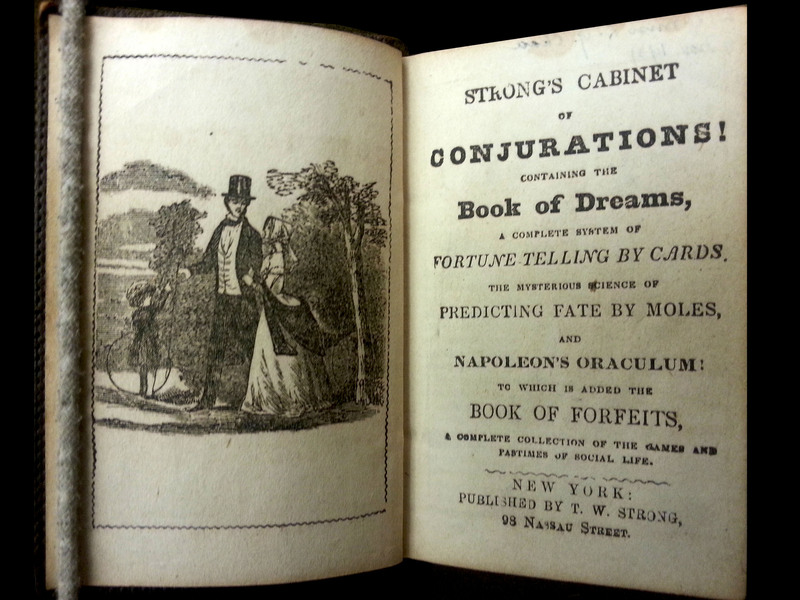 : Containing the Book of Dreams, a Complete System of Fortune Telling by Cards. The Mysterious Science of Predicting Fate by Moles, and Napoleon’s Oraculum: to Which is Added the Book of Forfeits, a Complete Collection of the Games and Pastimes of Social Life (New York: 1850). This book lists alphabetically a long list of items that may appear in dreams with detailed insight to their meaning, some foretelling the future. 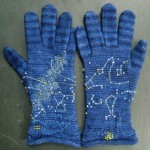 As I browsed (searching for knitting, crochet, needle, pin, thimble, etc.) I was surprised to see no mention of the everyday items used for making and mending clothing and accessories. However, my search was rewarded when I found a wonderful passage related to wool. The passion for wool, and stashing, among those of us that knit and crochet is an integral facet of our obsession with these crafts. I am sure many of us have dreamed of unlimited funds and space for adding to our collection. The feeling of enthusiasm upon entering a store full of yarn along with the tactile pleasure of choosing your next skein has touched all of us at some point in our lives. 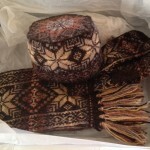 To dream of wool is likely not an uncommon occurrence among those in our creative community. The positive emotions we relate to wool are rooted in centuries past and are illustrated in this dream interpretation for WOOL found on page 134. “To dream you are buying or selling of wool, denotes prosperity and affluence by means of industry and trade; to the lover, it is a favorable omen, your sweetheart is thereby shown to be of an amiable disposition, very constant and deeply in love with you.